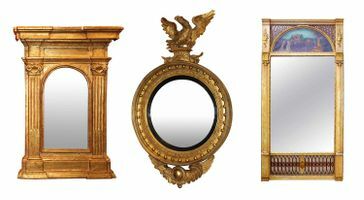 New Hampshire Antique Co-op is pleased to present Three Centuries of Mirrors: Reflections Through the Ages, a curated collection of period and vintage mirrors from the late 1700s Rococo styles to the 1950s mid-century modern era. A mirror is considered to be any glass, polished or smooth surface that forms images by reflection. The first mirrors to appear in nature were the reflections seen on smooth pools of water. The first man-made mirrors were created in Egypt as early as 2500 B.C using polished brass. Glass mirrors appeared in Venice in the sixteenth century when craftsmen learned to make glass sufficiently clear to back with foil—a tin and mercury amalgam—and produce a true image. Known as “looking glasses,” they quickly gained in popularity throughout Europe and the rest of the world. The word mirror is derived from the Latin word “mirari” which means “to wonder.” In Greek mythology, Narcissus was the beautiful son of a river god. Seeing his own reflection in a pool of water when he stopped for a drink, he fell in love with his own image. Unable to possess it, Narcissus pined away in sorrow and turned into a flower. Although the original intent of the invention of mirrors was to reflect images for the sake of vanity and decoration, the scientific importance of the mirror soon became apparent. From microscopes and mathematics to astronomy and architecture, mirrors found their way into the world of science. While the use of mirrors for scientific purposes grew over time, the decorative nature of “looking glass” mirrors also grew and expanded over time. In Three Centuries of Mirrors: Reflections Through The Ages, decorative mirrors of all kinds are on display, from gilded Federal convex wall mirrors, Italianate dressing mirrors and vintage starbursts to eglomise, brass and polychrome framed mirrors in round, oval and irregular forms. Be sure to visit Three Centuries of Mirrors: Reflections Through The Ages in the Tower Gallery at New Hampshire Antique Co-op for an insightful display and sale of antique and vintage mirrors and looking glasses. The exhibit is on view until March 31.